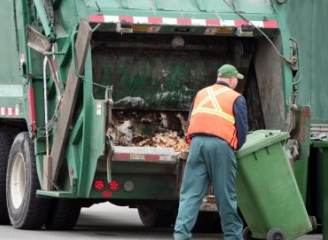 Salute: High praise for garbagemen … really! Simple thesis: just hang on the couch and let taxpayers foot the bill for your food, phone and, now, health insurance. The issue is front & center again. Of course, WaPo thinks that’s a bad thing. Evidence: a couple of heart-wrenching anecdotes of genuinely destitute folks who the Post asserts (wrongly) would be thrown out in the cold. Memo to WaPo: The plural of “anecdotes” in not “data”. Right when I was about to get terminally discouraged (again), I headed out to run some errands. On the road, my faith in the American spirit was refreshed. Let me emphasize: it was cold, rainy day. As I was cruising down the street, a garbage truck stopped in front of me..
Off jumped a dude to dump some garbage into the crusher-truck. He shot back: “No problem, man, it’s my job”. That exchange has been on my mind. He’s probably not earning that much, and he’s certainly not basking in prestige..
He’s probably not even in line for any kind of clean, inside work promotion. He could sit home and wait for the mailman to deliver his government benefits. He gets up each morning to bust his hump doing dirty work. Suffice it to say, that guy has my respect. I hope he catches a break some day. This entry was posted on May 24, 2017 at 6:56 am and is filed under American Spirit, Employment - Jobs, Motivation, Work Ethic. You can follow any responses to this entry through the RSS 2.0 feed. You can leave a response, or trackback from your own site.